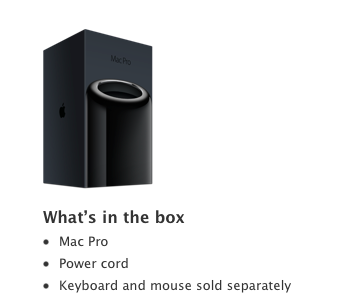 "Keyboard and mouse sold separately"
Discussion in 'Mac Pro' started by Ljohnson72, Oct 22, 2013. Am I the only one that finds this a bit annoying? I mean it's not a huge deal, but for the price you'd think they'd give you a keyboard and mouse/trackpad. They probably wouldn't fit in the new packaging. They probably do not have any black anodized ones ready to go yet either. Get where your coming from though. £2500 and not even a mouse!!! No you're in good company. That's an absolute joke - ****ing shameful actually, an absolute disgrace! Shame on you Apple, shame on you. Or its just scheme to make more money by offloading this necessary additional cost to the consumer and not bundling it. Kinda sad that an $800 dell desktop comes with a keyboard and mouse. First thing I do with my Mac Pro's keyboard and mouse is sell them and buy what I really wanted in the first place. Looks like they are really moving into the Pro-Workstation direction. But hey, you get two D300 GPUs for free, even if you don't need them. Maybe you can trade one of these crappy low-end cards against a decent keyboard. Eh, I don't mind. I have a mechanical keyboard and high end mouse. I would think most pros either have a ton of Apple keyboard/mice sitting around or they have a high end set up already. The Apple kb/m would go straight into my junk pile if I bought one of these. It's the first time in their history that Apple's flagship computer has ever been sold without a keyboard and mouse - and you can't use the bloody thing without one!!! It's absolutely absurd that after spending £2500, you don't get the fundamentals. For me it means I'll be selling my prior Mac Pro incomplete without its keyboard and mouse or having the hassle of buying a new set - I think it's ridiculous and totally unnecessary. it's bad enough losing the internal storage options, optical bays and graphic card upgradability, but no ****ing keyboard and mouse...that's just taking the piss! Whoa. You'll have no problem selling your old Mac Pro without a $50 kb/m combo. I wouldn't want to touch a kb/m used that someone has been handling for years. No thanks. A monitor is fundamental and it doesn't come with that. There are better things to be mad about than no kb/m. Like no HDD space haha. I already have a wonderful Matias tactile keyboard and a great Logitech mouse so I don't need the horrible keyboard and unusable mouse that Apple tries to sell these days. If you're planning on spending $2999+ on a computer and worrying about the mouse and keyboard, then you should probably not be spending that much on a computer since the extra costs are inconsequential and you would probably want to buy better stuff anyway. If you're planning on spending $2999+ on a computer and worrying about the mouse and keyboard, then you should probably not be spending that much on a computer since the extra costs are inconsequential and you would probably want to buy better stuff anyway. Not so, all costs are consequential. If not, please send me £99 so I can go and buy a set, I'll PM you my Paypal address for the inconsequential amount. If they are (as you claim) inconsequential, it's just as easy to include them as not. Every Mac Pro ever made has had them included, so to suddenly decide that because you're a 'pro' you have to buy your own is bizarre. Apple took the same silly stance with wireless in the Mac Pro too a few years back, (apparently 'pro's' back then didn't use wifi), so it was an optional extra. This of course (much like now) is nonsense and they soon relented and now wireless is built in as standard. It's a poor decision by Apple.. Still, I look forward to my PM and the inconsequential £99 - thanks. No so, all costs are consequential. I am sorry, but last time I checked I was not running a charity and neither is Apple. About time they stopped shipping them with keyboards! Its not much money, but why should we pay for them if we don't need them? Its a pro workstation which often needs dedicated keyboards laid out for the apps they are used for. I have a closet full of the things! Do people here seriously not have better keyboards than what come standard? Not sure they are passing on the saving though! When I spend $4K on a computer, I don't give a crap if I have to buy the keyboard and mouse or not. You have to buy external drive enclosures and a slew of other things, most likely. Keyboards and mice become farts in the wind. I can see some people being upset about the keyboard, but do you seriously use a magic mouse? Its such a waste every time we unpack a box and no one wants a free one! Yeah, the gold finished iPhone took some serious work. If you think this is the main complaint, you need to look at some other threads! Me too. I hate Mac keyboards/mice. I do understand why some are hacked off about this though. This should really come with a sweet black keyboard and black mouse. What would that cost Apple? $9 or so? Pretty ridiculous since you obviously need a keyboard/mouse. It's not as if this is a rack-mounted server. This is still a desktop machine. It's not a decision changer, but frankly it's a a$$h*** move by Apple. Come to think of it, it doesn't come with a home or office either! Where the hell am I supposed to use this ridiculous excuse for a machine? Mac Mini doesn't come with a keyboard and mouse either. Personally I love my Moshi backlit keyboard and Magic trackpad. Glad They're NOT bumping up the price by $140 and "throwing in" an unneeded keyboard and mouse.